The eco style, gaining an increasing number of practising followers. In harmony with nature – how to arrange the interior in the eco style? The eco style, gaining an increasing number of practising followers, was born from overload. Overload is any excess of: devices, vibrant colours, gadgets, trinkets, artificial smells… An excess of items is overwhelming, creates chaos in the space, minds and hearts. The answer to this overload is the eco trend, more and more widely used in everyday life. The trend includes not only the arrangement of space. It is based on a change of mindset – moving from consumerism to a life in harmony with nature. It is also a shift towards giving items a second life, as well as manufactured by hand instead of mass production aimed at quick profit and minimising the cost. Harmony with nature encompasses all spheres: from rational use of resources and eating healthy, through work hygiene, outdoor activities to healthy sleep. Daikiri Collection, Ceramika Paradyż. Welcome to a presentation of interiors that will promote living in harmony with nature every day. The best days start right here! 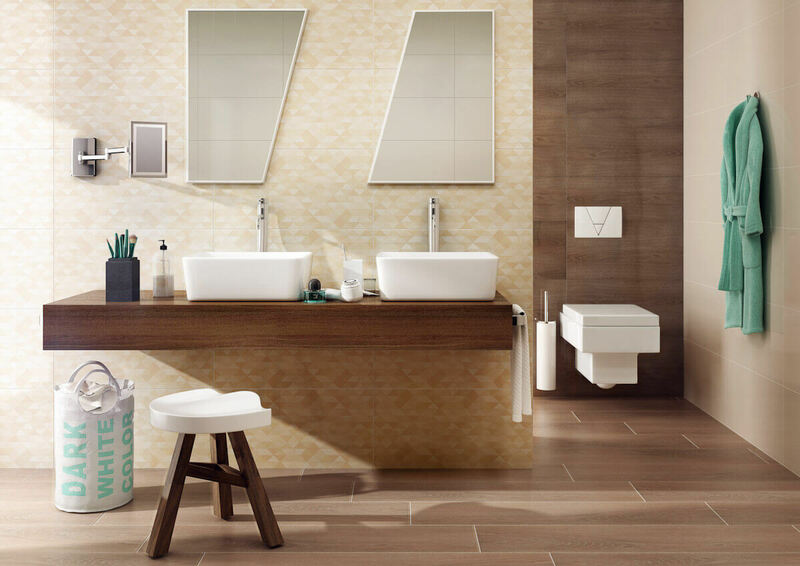 The basis for arranging the bathroom in the eco style is usually wood or stone – both natural and imitated by ceramics. You will find here only devices and items that are useful or create a natural atmosphere. 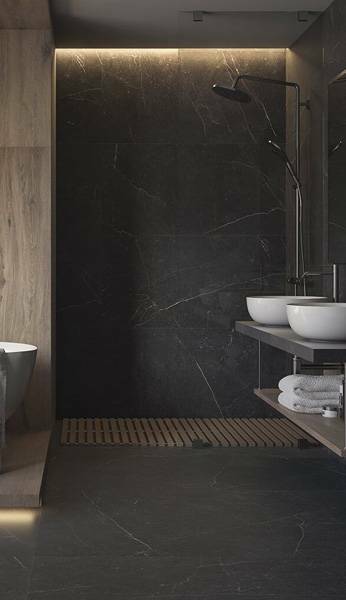 Ceramic tiles with a non-uniform appearance of raw rock promote morning concentration. Skylight in the shower part pours the sunlight into the bathroom. Wood-like tiles on the floor, wooden stool and live flower in the pot enhance the natural effect. Naturstone Collection, Ceramika Paradyż. Cosy bathroom with ceramic tiles imitating light and dark wood was decorated only with the frugal geometry of tiles, mirrors and shapes of sanitary ceramics. Domus collection, Ceramika Paradyż. The smell of herbs greets the entering household members and guests, stimulating the appetite. Delicious and healthy meals, full of vegetables and fruits ripening in the sun are created in a kitchen like this one. Ecological style in a modern version. Frugality of forms, colours and shapes highlights the natural, wooden look of the ceramic floor and the wooden cubes over the kitchen counter. Pago collection, Ceramika Paradyż. Meals look and taste better than in the best restaurant when served surrounded by subdued colours of a dining room in the eco style. The freedom of thoughts and words rules here. The main characters of this space are the people, as well as the natural colours of both the interior and accessories. 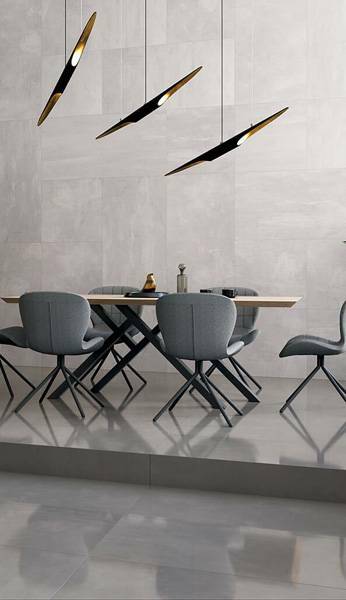 Grey colour of raw stone emphasizes natural colours of delicacies on the plates and of other accessories. Trakt collection, Ceramika Paradyż. After dinner – if the weather allows it – it is nice to have a rest in the open air. The eco style on the terrace will be emphasized by wood-like or stone tiles and natural accessories, such as wood or rattan furniture and live plants. Such an atmosphere helps to regain your strength. The genius of nature can be found, among others, in a hexagonal shape. Now this perfect shape can decorate interiors and terraces. The collection of honeycomb-shaped tiles looks like wooden boards in two colours or a wooden mosaic. 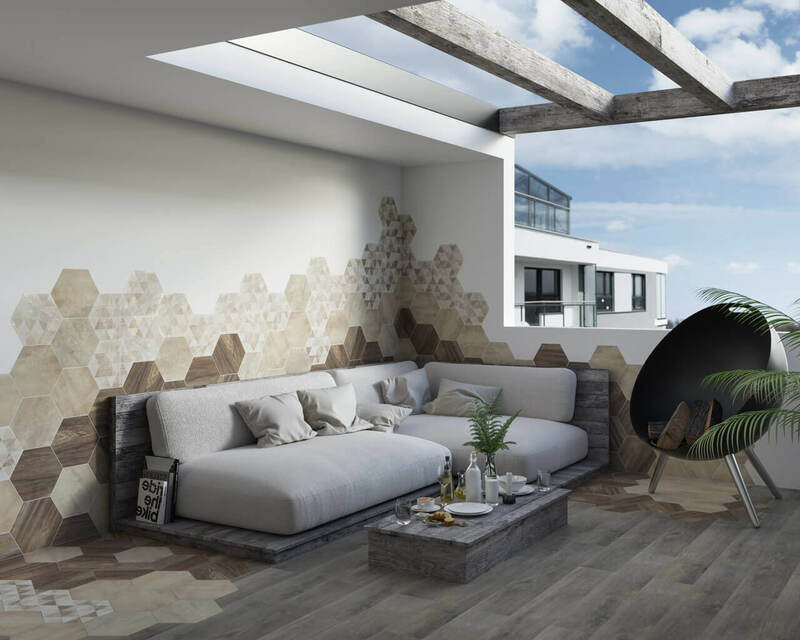 The combination of hexagons with boards-like appearance makes the terrace emanate with the tranquillity of nature. Hexx Universum collection, Ceramika Paradyż. In the eco-style living rooms, wood and stone, as well as usually bright colour palette – whites, beiges, greys, sunlight and candlelight dominate. Woollen cushions and blankets or jute rugs add cosiness. The dark wood is very elegant – and of course most consistent with the trend. The warmth of wood-like tiles encourages, among others, to play with children directly on the floor. Hasel collection, Ceramika Paradyż. Full of sunlight, a light-grey living room opens to the nature thanks to its large window glazing. 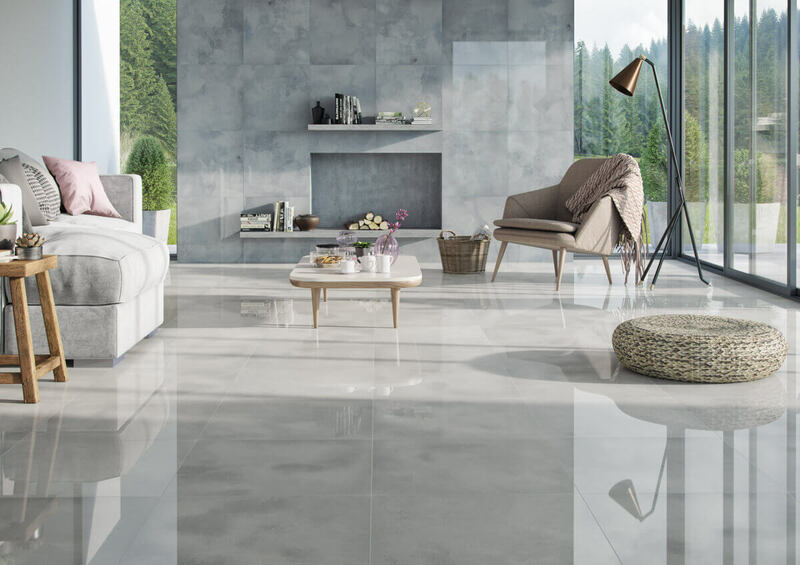 Bright ceramic tiles with a glossy surface on the wall and floor enhance the uniqueness of the stone. Wood in the fireplace, sea grass seat, wooden furniture, sofa with natural upholstery – all these elements make the time spent in the eco living room peaceful and happy. Naturstone Collection, Ceramika Paradyż. There is nothing better than a warm bath, especially in a bathtub. It does not matter if it is a free-standing bathtub in a large bathroom or a built-in bathtub in a smaller one. The colours of wood and the pattern of grains along with floral motifs help to achieve the evening calmness and emphasize the eco style of interior. 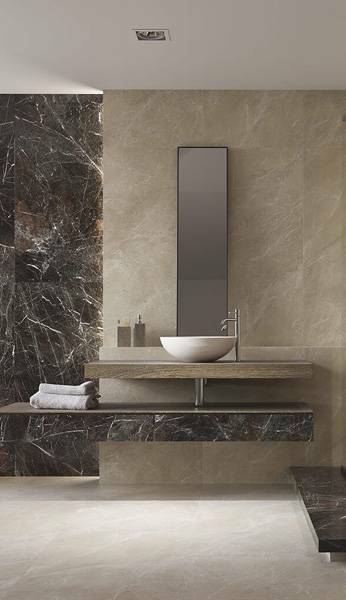 Light beige and darker brown of wood-like tiles add cosiness to the bathroom. Leaf motif brings you to nature even closer. Wooden cabinet and jute rugs complement the comfortable eco bathroom. Antonella / Anton collection, Ceramika Paradyż. Small space of the bathroom is great for ecological arrangements. 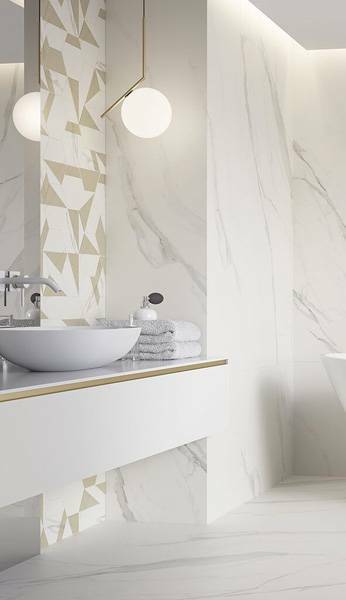 Every centimetre counts here, so the shelf above the bathtub transforms smoothly into a table top with washbasin. 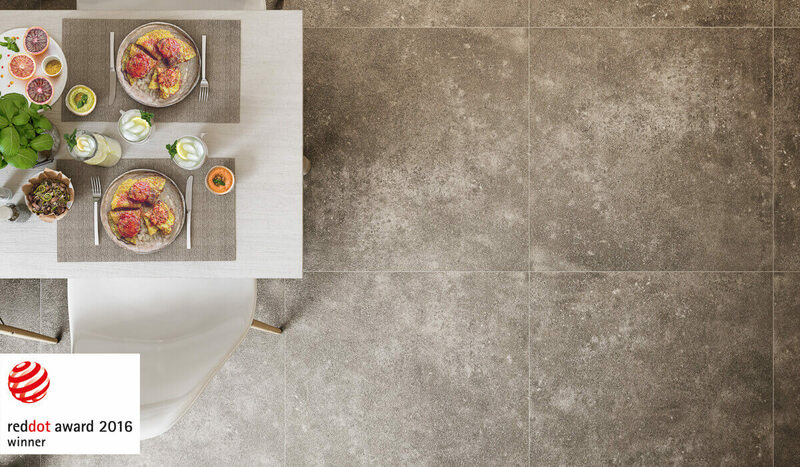 Warm beige of tiles and imitation of wooden pavement in decorations, fit into the eco-stylistics. Wooden stool with storage space emphasizes the character of the interior. Adagio / Adago collection, Kwadro Ceramika. It is good to end a day spent in harmony with nature in a bright, cosy, ecological bedroom. And if you will sleep on a bed made of pallets – your dreams will probably be even better. Ecological care for the planet manifests itself in giving the items a new life. The look of old, chipped boards, a bed made of pallets and only natural materials create a cosy bedroom. Arke collection, Ceramika Paradyż. The rhythm of days passing in harmony with nature is subdued and calm. There is time for life, for fun, reading, enjoying food, the warmth of the sunshine, fireplace and candles. The care for the environment goes hand in hand with the care for one’s own good mood because only in the state of harmony we can function well in the world. The internal sense of balance is influenced by many factors – the arrangement of home space being one of the most important. What to keep in mind when arranging an interior in the eco style? Bright, calm and subdued colours. Wood and stone – these raw materials are best for the eco style! Eco-style furniture is usually made of wood or rattan. Textiles – wool, cotton or jute will be perfect additions. Plants – green, fresh elements of nature will emphasize bright colours. DIY Accessories – self-made accessories, which will give a new life to old items are the essence of interiors in the eco style. Minimalism and utility of items will limit chaos in the room.